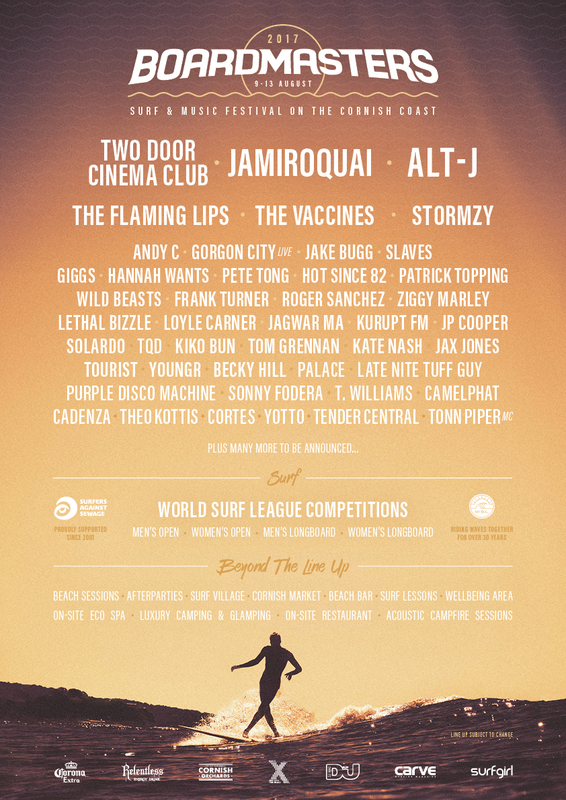 Boardmasters has revealed its second wave of acts set to perform at Cornwall’s own surf and music festival, taking place this year from Wednesday 9th through Sunday 13th August 2017. 29 new acts are set to join the bill, with headliners Two Door Cinema Club, Jamiroquai and Alt-J already locked down. On the dance music side, Hannah Wants, Gorgon City, Pete Tong, Hot Since 82, T Williams, Purple Disco Machine and Sonny Fodera have all been confirmed to play the five-day festival — you can check the artwork below for the full list. Established in 1981, last year the grassroots surf and music festival welcomed over 150,000 party people to sunny Cornwall, with the event kicking off over two separate beaches: Fistral Beach and Watergate Bay. The festival isn't just about partying: expect surf competitions, skating and BMX events and health and wellbeing workshops, plus the option to stay in the Campsite Village or upgrade to a more private VIP experience. Boardmasters will take place from 9th - 13th August 2017 in Cornwall — head here for tickets and information.